BRG Ruby Tree Golf Resort (Formerly Doson Seaside Golf Resort) features a basic 18- hole golf course styled to curve alongside a large reservoir. This golf course is a short drive from Hai Phong and Halong Bay, and 2 hours from Hanoi. The Ruby Tree Golf Resort’s par-72 course was designed by the Australian firm Pacific Coast Design Company. The range of greens and hazards throughout accommodate a variety of skill levels and create a good golfing experience. Constant sea breezes make Ruby Tree Golf Resort fun to play even in the hot weather. Ruby Tree opened in 2010 under the name of Do Son and one of the top golf courses in north east Vietnam. Well-contoured greens, coconut palm-lined fairways, cooling ocean breezes and the fabled Dragon Mountains are all standout features of Ruby Tree. With four sets of tees, numerous water hazards and large flower beds, Ruby Tree Golf Resort has been designed around salt water lakes and offers something for golf of every skill level. An overall nice course for those golfers in the area. Vinpearl Golf Haiphong is located just outside Haiphong City and 120 kilometers East of Hanoi. The entire 36-holes are fitted on an 872 hectare parcel of land on Yu Yen Island. The island sits at the mouth of where three local rivers meet before entering the East Sea. The river delta area is ideal for a golf course as it has mostly open and wet year round conditions. Designed by IMG, Vinpearl Haiphong features two distinct courses; the Lakeside Course and the Marshland Course. Platinum Paspalum grassed fairways and Tiff Eagle greens on both courses ensure good year round playing conditions. The Lakeside Course is a par-72 resort course built through a series of interconnected lakes and that plays 7,333 yards from the tips. Water comes into play on 12 holes. Fairways are generally wide and greens have smooth but subtle undulations. Areas in front of the greens are open which facilitate run-up shots. Being long off the tee and on the correct side of the green are the two critical factors to scoring well here. The Marshland Course plays through semi-natural wetlands and presents a completely different style of golf as compared to the Lakeside Course. Fairways are narrower which rewards shot placement accuracy well ahead of driving distance. Better golfers who can shape their shots will like this layout and style of golf. The par-72, 7,291 yard Marshland Course also has many strategically placed grass-faced bunkers and medium to small sized greens which further demands shot accuracy to make par. Song Gia Golf Resort is located outside Hai Phong in a natural environment where Song Gia and Song Mok Rivers meet together. 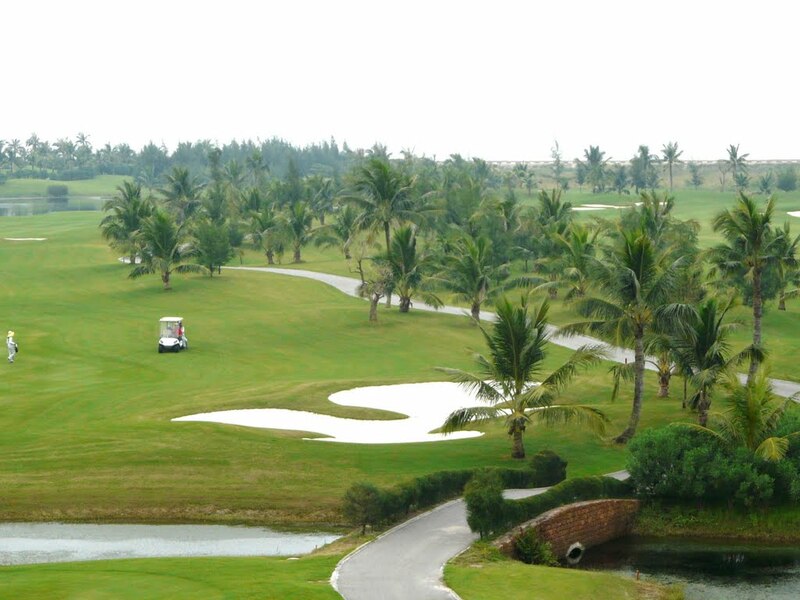 The Hai Phong golf course is located 30 minutes from Halong Bay or 2 hours from Hanoi. 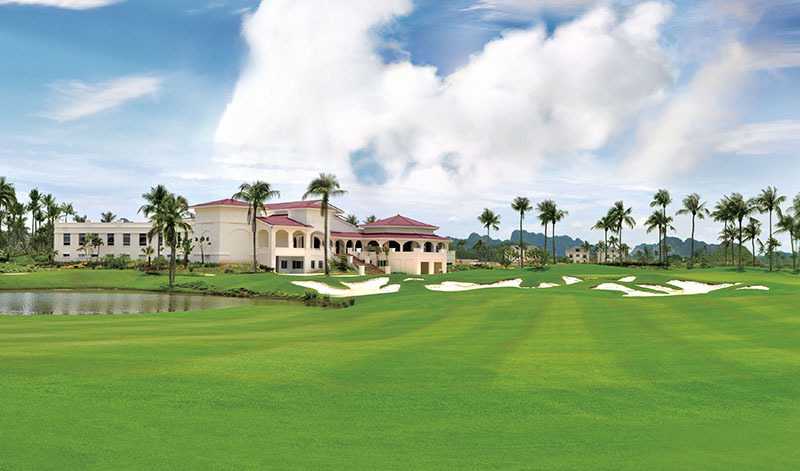 Song Gia Golf Resort is one of the most beautifully landscaped courses in North Vietnam and features well-groomed fairways and greens with extensive flower beds on each hole. Paspalum grass is used throughout the course ensuring good year round playing conditions. 27 holes are available for play including the par-71 championship course consisting of River Nine and Ocean Nine and the 9-hole executive par-3 course; the Hill Nine. LC Ha Long Bay Golf Club opened for play in August 2017. Twenty minutes from Ha Long City and three hours from Hanoi, the 18-hole championship Schmidt-Curley designed layout offers stunning scenic ocean views over the famous UNESCO world heritage site. The golf course sits above the old town of Ha Long Bay and overlooks the spectacular limestone karst-riddled bay. 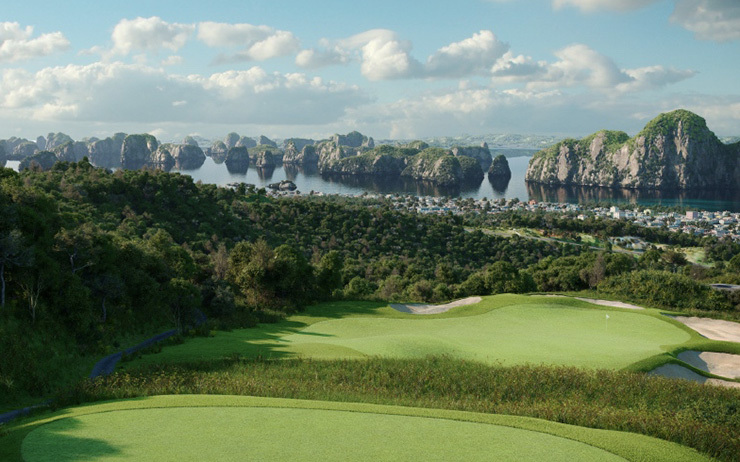 The Ha Long Bay golf course belongs to the FLC Ha Long luxury resort complex and serves as the centerpiece of the project. The FLC Ha Long Golf Club course is short at 6,800 yards from the tips and plays to a par-71. Paspalum turf from tees to greens ensure good year-round playing surfaces. While the focus is on playability and scenery, there are a variety of challenges to test the skills of even the most seasoned golfers. Four holes directly face Halong Bay, and others are laid out around cliffs and valleys. The five par-3 holes all have a panorama view of Ha Long Bay with two (the eighth and twelfth) likely to be compared to the iconic 7th hole at Pebble Beach, California. Par-4’s and par-5’s feature accessible landing areas that make even mishit drives still playable. Sea breezes often blow off the bay and make accurate club selection a key to shooting well.